Making an entrance with custom-made lighting. 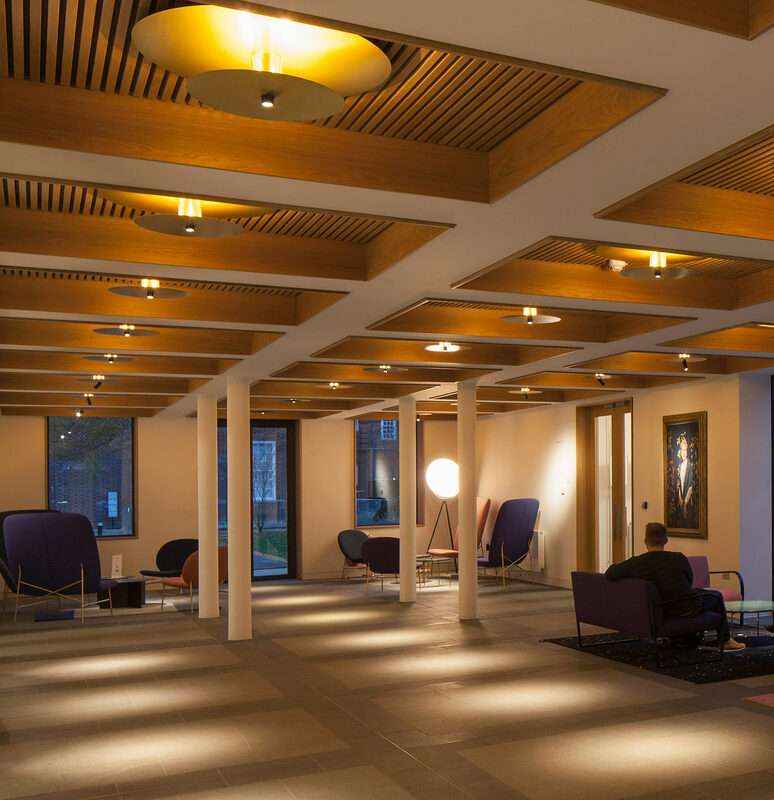 The recently opened Dorothy Garrod Building is a contemporary addition to Newnham College, Cambridge that includes a new Porter’s Lodge and entrance space. In total, we were commissioned to create 36 surface mounted, multi-functional coffer luminaires for the space, to soften the clean lines of the ceiling architecture and create a sense of warmth and rhythm. 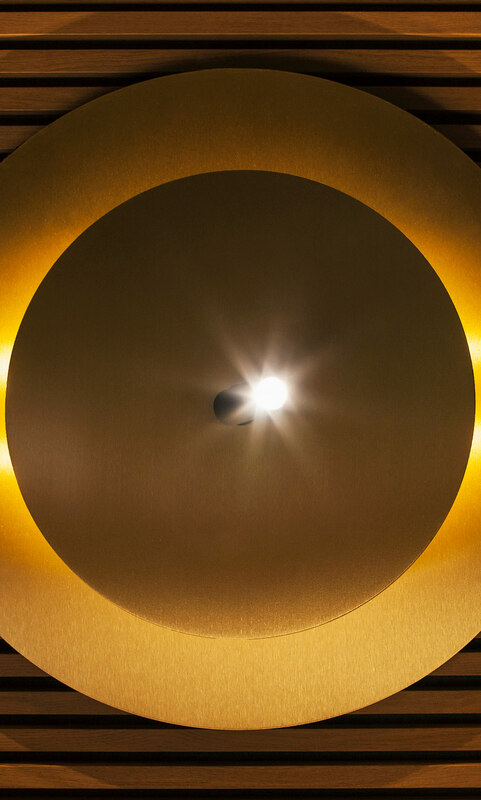 Each custom luminaire consists of two tiered circular brass plates. The lower plate conceals a series of small LED lights that illuminate the larger upper disk close to the ceiling, producing a soft ambient glow of reflected light, highlighting the rich tones and texture of the timber coffers. To create a layer of accent lighting we placed a pop out adjustable spotlight within the lower disk. 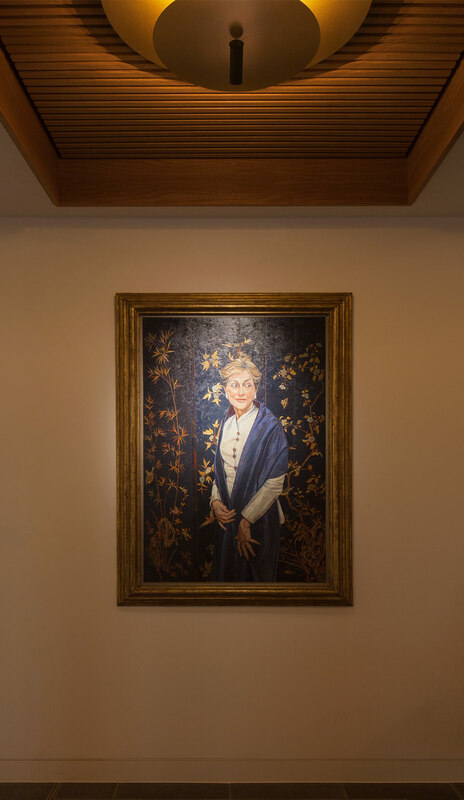 When pulled out and angled, these allow targeted beams of light to accentuate artwork on the walls. Alternatively the spotlights can stay partially hidden to create a pool of illumination on the floor directly below. The design enables the ambient and accent lighting to be controlled and dimmed separately. It also takes into consideration emergency lighting, which is cleverly concealed in some of the luminaires, ensuring this necessary function does not impact on the aesthetics. The overall effect is a beautifully balanced yet characterful space, which is warm and welcoming.